If you are looking for a cheap electric skateboard our Yuneec E-Go review might be helpful for you. With a price of 500 USD you will get a complete electric longboard for 25% of the price compared to the top models. Our Yuneec E-Go review includes an unboxing video and test ride video at the end of the article. 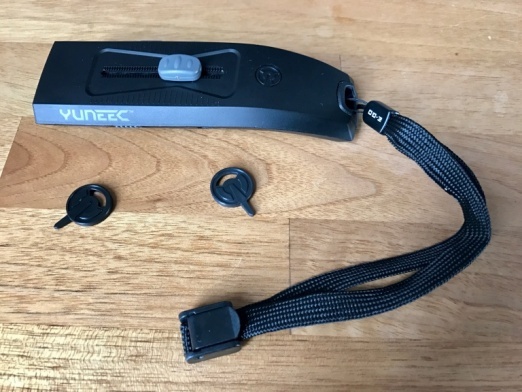 The electric Skateboard from Yuneec ships pre-assembled with bluetooth remote control, power supply, cables, a sticker set and a universal tool. The pairing of the remote control looked pretty complicated, but was successful at the first try. 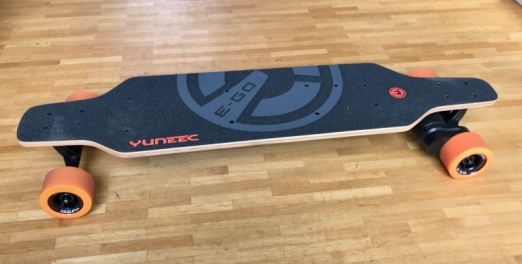 You can also find a free app called “E-Go Cruiser” on the app store which connects directly with the Yuneec E-Go skateboard. 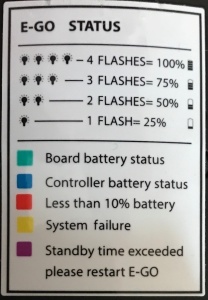 The remote control gives you an indication of battery power for the board itself and the remote control by blinking in different colours. You need to get used to it. See the sticker on the remote below. The slider for acceleration is handy, the acceleration is smooth, but the braking comes with a delay and could be stronger. You can easily switch from ECO to SPORT mode, which changes the power / acceleration of the board. However, if you want to switch between SLOW (up to 8 mph) to and FAST (up to 12.5 mph) you need a special pin tool, which you can see in the remote picture above. The Yuneec E-Go has only one motor at the left rear wheel which serves you with 400 watt power. The top speed of 12.5 mph was easily achieved in our Yuneec E-Go review (rider had 198 pounds) and the acceleration was good. We had fun at our test ride. The charging time is listed as 3-5 hours (took 5 hours for us) which should bring you up to 18 miles under best conditions. With our riding style we achieved 9 miles., which is reasonable for the price point and weight. 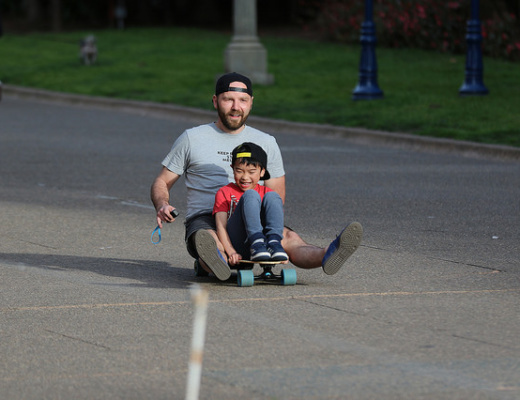 The board is just 14 pounds and the deck has a reasonable quality, the wheels are , …, okay. The protection of the USB port is bad, but we recommend anyways not to ride on wet streets. 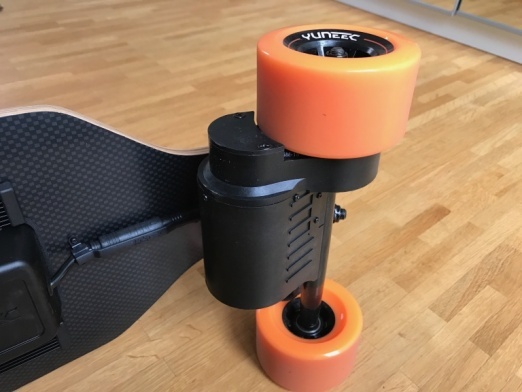 The Yuneec E-Go is a cheap electric skateboard which however let’s you enjoy your electric ride. It is probably a good choice for beginners or as a backup board. We have to see how the board is doing over a long time and may update the review at a later time. Last but not least our 2 videos for the unboxing and test ride. The test ride video does not come with any cuts or background music, because we want you to give a feeling about the acceleration and motor sound. The video is showing an advanced rider which is riding the board the first time in FAST and SPORT mode.